Excitement Scored at CueBlocks' 4th Anniversary! Another tremendous year but not just another celebration. It was CueBlocks’ Fourth Anniversary on July 12th 2009 and this time it was some adrenalin rushing Paint Ball adventure and a sumptuously fulfilling dinner at Barbecue Nation (BarbeCue was not a deliberate choice, it just happens to be one of our favorite hang outs) that marked this momentous day. After the exciting excursion last year at Sadhupul and an enthusiastic account given by Sarthak of Paint Ball, we finally decided to test our mettle in a Paint Ball battle at Xtreme Warzone, located 5 Kms from PGI in village Syoonk. Now, Paint Ball sounds like some innocent color splashing fun doesn’t it? Well, it’s not! 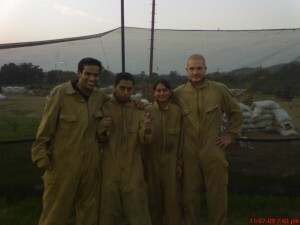 Contrary to its name, Paint Ball is a different ball game altogether with guns, paint bullets and all. It is a full on battle for pride, honor and bragging rights and we found that out as soon as we arrived there. The way to the venue was a bit confusing and the roads were really narrow but Avneet’s superb sense of direction and driving finally got us there. The moment we saw our battlefield, we knew that the evening was going to be rough, tough and gory (and gory does not mean paint at all!) They even made us sign a lease of no responsibility! Ouch! Police Team – All Ready to Rumble! So the battle was on between the Army and the Cops and it wasn’t a one sided combat as many of you may be tempted to think! The Police fought with enough resilience but was not strong enough (or may be lucky enough) to outdo the experience and wits of Sarthak, who lead the charge quite naturally in all the three games we played! The burly instructor introduced us to the game and explained all the safety rules. He warned us, in his thundering voice, of the dangers inside the battlefield and repeatedly told us not to remove our masks once inside the battleground (which thankfully, no one did as the paint balls hit really hard due to their high velocity and the force with which they are fired). Not being able to wait any longer, the respective teams stormed the arena which cannot be mentioned without a detailed description! It was a real battleground with bunkers, trenches, barrels, stacks of sacks, etc. The arena ignited the feisty fires in all of us and we were soon fighting with everything we had! There was no dearth of misdirected shots but some got their aims well and the first game was won by the Police! However, soon the sweat, heat and bad light blinded our passions (quite literally) and many people caved out within minutes. However, the next two games of Capture the Flag demanded sharp pugilist skills and every one was up for it with equal zest! The first of the two games ended with Sarthak capturing the flag and reaching at the Police end without much resistance, even when David was shooting from a few yards away! (Better luck next time). In the second battle of Capture the Flag, Nishant and Rohit, heroically jumped in the same trench as Sarthak, one after the other, but like Don Quixote couldn’t really taste the sweet success of victory. Sarthak then passed the Flag to Aseem who with the stride of a noble knight ran with all his might and also I think for his life to reach to the Police end. The volley of bullets fired at him, (from long distance) did nothing to deter his devotion and dedication for his team! Good work Aseem! After the rugged encounter, we headed off to Barbecue Nation, sector 26, where the battlefield rivalry turned into camaraderie and back-slapping exchanges. It however, did not prevent Sarthak from boasting off his war antics! The evening from thereon was spent in laughs, funny exchanges and a hilarious recall of the battle that had just ensued at the Paint Ball venue. The dinner at Barbecue is always delicious but the company and the occasion made it all the more special with all of us happy to be celebrating once again what got all of us together in the first place…CueBlocks! With CueBlocks becoming more daring every year, we might just plan a Rock Climbing venture for the Fifth year! What say?